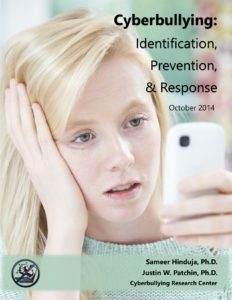 This cyberbullying guide is a nine-page summary – filled with as much useful information as possible – to equip educators, parents, and other youth-serving adults to spot cyberbullying, respond to it appropriately and meaningfully, and to prevent its future occurrence among those they care for. If you only have time to read one fact sheet from the Cyberbullying Research Center to get up-to-speed about the problem and what you can do, read this one. Thank you. Great resources. I like that I can just print out the word searches. It&apos;s a thorough introduction of the issue, comprehensive and informative. Thanks.